In its 1996 report, Gathering Strength, the Royal Commission on Aboriginal Peoples called education “the key that unlocks the door to the future” (RCAP, 1996). Education is a priority for First Nations people, Inuit and Métis. Shawn Atleo, National Chief of the Assembly of First Nations, stated that “Education offers the spark that can light the fire of potential in an individual” (Atleo, 2012). At the same time, Terry Audla, President of Inuit Tapiriit Kanatami, identified education as a priority for Inuit, stating that “Existing socio-economic conditions will worsen unless more Inuit children graduate from high school” (Audla, 2012). Clément Chartier, President of the Métis National Council, also noted that “Education must prepare Métis people to fully participate in the economy of our communities and Canadian society” (Chartier, 2013). A growing number of First Nations people, Inuit and Métis have been completing high school and pursuing postsecondary studies (CESC, 2007; Statistics Canada, 2008). Data for 2011 from the National Household Survey (NHS) show that attainment rates for First Nations people, Inuit and Métis at the trades and college levels are comparable to those of the non-Aboriginal population. However, many First Nations people, Inuit and Métis do not finish high school, and their university completion rates lag behind those of the non-Aboriginal population (Statistics Canada, 2013a). Until recently, research that addressed factors related to school outcomes specifically for Aboriginal peoples in Canada was limited. In 2007, the Canadian Council on Learning, in partnership with First Nations, Inuit and Métis communities and organizations across Canada, undertook an initiative - “Redefining how Success is Measured in Aboriginal Learning.” Frameworks were developed that recognize that Aboriginal learning is holistic and lifelong, comes from many different sources, and is rooted in Aboriginal languages and cultures (Canadian Council on Learning, 2009). Acknowledging these frameworks, the 2012 Aboriginal Peoples Survey (APS) examined a diverse range of education experiences among First Nations people living off reserve, Inuit and Métis. Based on a thematic approach, data were collected that allow an in-depth exploration of factors associated with education outcomes. The present report focuses on the education and employment experiences of adults aged 18 to 44 - a cohort who had recently been enrolled in the school system or were pursuing postsecondary education. Central to this report are two groups who form the basis for understanding the education and employment experiences of First Nations people living off reserve, Inuit and Métis aged 18 to 44: “completers” and “leavers.” “Completers” have fulfilled the requirements for a high school diploma or equivalent. “Leavers” do not have high school credentials and were not attending elementary or high school at the time of the survey. 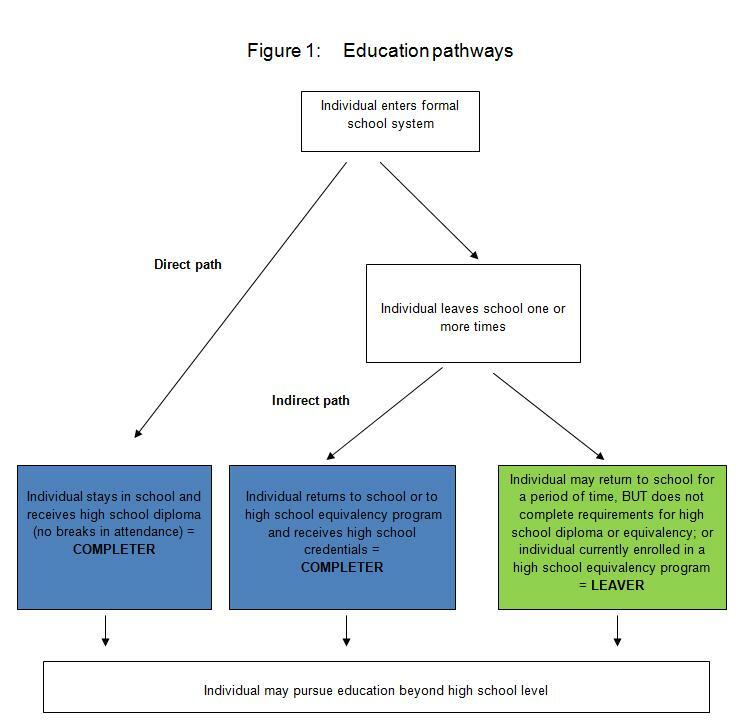 Individuals who started school and stayed until they received a high school diploma (no breaks in attendance) are considered to have followed a “direct” path to completion. Those who completed high school with one or more breaks in attendance are considered to have followed an “indirect” path (Figure 1). In recognition of the uniqueness of each of the three Aboriginal groups, separate analyses were conducted and reported for First Nations people living off reserve, Inuit, and Métis, with no systematic attempt to make comparisons between the groups. This report is, therefore, organized into three parts: Part A contains the findings for off-reserve First Nations people; Part B, for Inuit; and Part C, for Métis. Each set of findings is self-contained and was designed to be read independently. The analysis for each group is presented in five sections. Sections 1 and 2 examine an array of education characteristics for First Nations people living off reserve, Inuit and Métis. These sections compare high school completers with leavers on variables such as education pathways and reasons for leaving or returning to school. As well, school attendance and achievement, participation in extracurricular activities, mobility, peer influence, parental support, and school environment during respondents’ last year in school are explored. Section 3 describes the postsecondary education experiences of First Nations people living off reserve, Inuit and Métis, based on indicators such as postsecondary credentials, moving for postsecondary studies, distance education, funding, and reasons for not finishing postsecondary schooling. The 2012 APS also collected data on various aspects of the employment experiences of First Nations people living off reserve, Inuit and Métis. Key issues - employment and unemployment, challenges to finding work, employment income, and non-participation in the labour force - are examined in Section 4. Finally, Section 5 examines barriers to further schooling, such as cost, family responsibilities, feelings of being unprepared, lack of availability of courses, and health. This section also explores plans for further education. This report explores the education and employment experiences of those who have a high school diploma or equivalent (“completers”) and those who were not attending school at the time of the survey and had not completed high school (“leavers”). This differs from highest level of educational attainment. Some “completers” may have obtained further education at a trade school, college or university, and so may have a certificate, diploma or degree beyond the high school level. Equally, some “leavers” may have obtained postsecondary credentials despite not having completed the requirements for a high school diploma. It is important to note that APS data were collected for off-reserve First Nations people, Inuit and Métis aged 6 or older. Thus, analysis of the education experiences of children and youth currently attending elementary and high school, as well as those of individuals aged 45 or older, is also possible lending to a fuller understanding of life-long learning. Moreover, this report does not reflect the breadth of data collected in the 2012 APS. Information on topics such as physical and mental health, Aboriginal languages, housing, mobility, and residential school attendance is also available for further analysis. The 2012 Aboriginal Peoples Survey (APS) is a national survey of Aboriginal peoples aged 6 years and older in Canada - First Nations people living off reserve, Métis, and Inuit. It was designed to be thematic; questions emphasize education and employment, with a health supplement. The APS complements other sources of information, including the Canadian Census of Population and the National Household Survey (NHS). The 2012 APS was developed by Statistics Canada with funding provided by three federal departments: Aboriginal Affairs and Northern Development Canada, Health Canada, and Employment and Social Development Canada. c) Report being member of a First Nation or Indian Band. The target population excluded people living on Indian reserves and in Indian settlements in the provinces and in selected First Nations communities in the territories. Sources of data on First Nations people living on reserve include the Census and the NHS and a more in-depth survey (The First Nations Regional Early Childhood, Education and Employment Survey) led by the First Nations Information Governance Centre (http://www.fnigc.ca). This report presents the results of an analysis of a subset of data from the 2012 Aboriginal Peoples Survey (APS). The focus is First Nations people living off reserve, Inuit, and Métis aged 18 to 44 who were not attending high school at the time of data collection. By studying a cohort who recently left the school system or who were pursuing postsecondary education, this research can be used to help understand current needs and challenges, and to provide insights for future planning. Although the APS collected data for First Nations people living off reserve, some respondents may have lived on a reserve and/or attended school on a reserve in the past. The Aboriginal identity definition is used in this report. In recognition of the uniqueness of each of the three Aboriginal groups, analyses were conducted and reported separately for First Nations people living off reserve, Inuit, and Métis. However, these three groupings are not necessarily mutually exclusive - it was possible to report both single and multiple responses to the Aboriginal identity question on the APS. For example, a respondent could self-identify as both First Nations and Métis. For this study, such respondents would be included in both the First Nations data and the Métis data. However, 99% of off-reserve First Nations, 98% of Inuit, and 98% of Métis respondents reported a single identity. The analysis is based on 5,418 off-reserve First Nations people, 2,457 Inuit, and 4,787 Métis. About 64% of off-reserve First Nations people were Status or Registered Indians. At the time of the survey, 80% of off-reserve First Nations people and 74% of Métis resided inside a Census Metropolitan Area (an area with a population of at least 100,000 of which 50,000 or more live in the urban core) or Census Agglomeration (an area with an urban core population of at least 10,000); 74% of Inuit resided in one of the four regions collectively known as Inuit Nunangat (Nunatsiavut, Nunavik, Nunavut and the Inuvialuit Settlement Region). The main comparison within each Aboriginal group is between high school completers and leavers. Differences between men and women and between two age groups (18 to 24 and 25 to 44) are reported when appropriate. Current place of residence was not analyzed in combination with retrospective data on education experiences, because respondents’ place of residence at the time of the APS might differ from where they lived when they were attending school. High school completion is influenced by students’ experiences over many years; the 2012 APS captured experiences at a single point in time (last year in school). For this reason, the cumulative effects of specific factors on school outcomes cannot be analyzed. Moreover, the characteristics of completers and leavers are based on retrospective data, and so are subject to recall bias. In addition, this analysis did not examine all the factors likely to be associated with high school completion. For instance, Aboriginal language knowledge, history of residential school attendance, or regional variations were not explored. Further, the 2012 APS did not measure respondents’ family structure (lone- or two-parent family) or family resources (such as family income) when they were attending school; nor did it gather data on “school inputs,” such as characteristics of the student body, school resources (expenditures per student, student-teacher ratio, etc.) or school structural characteristics (school size, location, public or private, etc.). Comparative data from the 2011 National Household Survey (NHS) are sometimes presented in this report. Data on the non-Aboriginal population from the 2011 NHS are for people living off-reserve, and not attending an elementary or high school. Responses of don't know, refusal, not stated were excluded from the denominators in the calculation of estimates. Two estimates were considered to be significantly different from one another if their 95% confidence intervals did not overlap. This is a conservative approach, as statistical tests of significance could detect differences even when confidence intervals overlapped. Estimates with coefficients of variation greater than 16.6% but less than or equal to 33.3% should be interpreted with caution. These are noted (E) throughout the report. Estimates with coefficients of variation greater than 33.3% were suppressed. All estimates from this report are based on survey weights that account for the sample design, non-response and known population totals. A bootstrapping technique was applied when calculating estimates of variance. A series of supporting data tables is available for this report. These tables provide data at the national level for First Nations people living off reserve, Inuit and Métis aged 18 to 44 for all themes covered in this analysis. Selected tables are also available for specific regions of Canada. To obtain the tables, please contact Statistics Canada by email at sasd-dssea@statcan.gc.ca or call 1 (800) 263-1136.